School leaders attended the Arkansas Association for Supervision and Curriculum Development Conference in Hot Springs, Arkansas, under the leadership of Interim Superintendent Linda English. 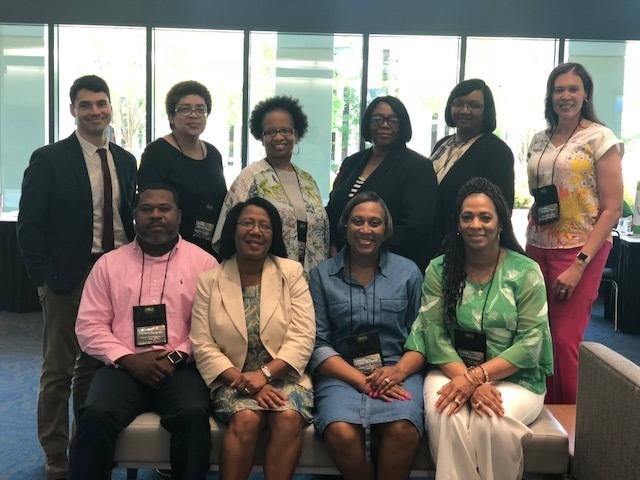 The conference allowed for team members to collaborate with a diverse group of educators dedicated to the development and support of leadership and best practices in curriculum, instruction, assessment, and supervision to ensure success for all learners. The theme this year was Rise and Shine: Personalized Learning for All, which provided strategies and models to help Arkansas schools lead the way in student centered learning. Pictured from left to right front row: Earnest Simpson, III, Linda English, Priscilla McDaniel, and Jewel Hamilton; back row: Randy Rotundo, Brenda Brown, Tonya Jones, Adrienne Watkins, Annetta Trice and Amanda Fears-Eaton.